Banks are not doing enough to reform in the wake of the foreign-exchange rigging scandal, a global regulator has said, warning that more regulation may be needed to force through improvements. Guy Debelle, a member of the task force set up by the Financial Stability Board to look into how forex benchmarks can be made less vulnerable to manipulation, said banks have not fully overhauled their forex teams to prevent inappropriate information sharing while their clients are balking at having to pay for services that were once free. Inappropriate sharing of confidential information with traders from other companies was one of the main issues highlighted by the scandal, which has seen six banks pay a total of $4.3bn in fines so far. “The group recommended that banks and other FX dealers separate their fixing business from their regular business . . . Adoption has been somewhat mixed,” Mr Debelle, who is also assistant governor of the Reserve Bank of Australia, said in a speech in Sydney on Thursday. U.S. retail sales unexpectedly declined 0.8% in January, following a 0.9% drop in December. The low oil prices did not boost sales as previously predicted and economists missed also on consumer confidence. However, analysts still believe sales will pick up in light of the ongoing improvement in the labor market and low prices. In the euro-zone, the hopes about a resolution for Greece, despite struggles, was joined by strong German growth numbers. In the UK, the hawkish approach from Carney helped sterling. The Aussie was pressured by weak employment data and the loonie was not boring as it moved sharply with oil prices. Japan GDP data: Sunday. 23:50. Gross domestic product contracted by an annualized 1.6% in the three months ended September, considerably lower than the 2.2% rise estimated by economists. On a quarterly basis, Japan’s GDP dropped 0.4%, amid lower business investment. Economies forecasted a 0.5% rise in the third quarter. Japan’s consumption tax increased to 8% in April but did not result in a major fiscal improvement. Policymakers consider another 10% rise to boost GDP growth. Economists expect GDP will rise 0.9% in the fourth quarter of 2014. Eurogroup meetings: Monday. The Eurogroup Finance Ministers will continue to search for a solution to the Greek debt crisis after failing to do so last week. The new Greek government is determined to change the rules of the game to relieve its staggering debt burden and loosen the tight austerity measures imposed by the previous Government. There is a better chance that this happens once Merkel passes the hurdle of state elections in Hamburg. UK inflation data: Tuesday, 9:30. The UK inflation rate declined sharply to 0.5% in December, from 1.0% in the previous month, reaching its lowest rate since May 2000. This decline was prompted by lower fuel prices. Analysts expected inflation to reach 0.7%. Bank of England governor Mark Carney still expects rate hikes in the next two years despite the sluggish inflation. Economists predict the ongoing inflation decline will continue while households are expected to benefit from these super low rates. UK CPI is expected to rise 0.3% this time. German ZEW Economic Sentiment: Tuesday, 10:00. German analyst and investor climate edged up in January amid low oil prices. Sentiment rose to 48.4 in January from 34.9 in December, reaching the highest level since February last 2014. The strong release beat forecast for a 40.1 reading. Economists warned that if the Greek situation deteriorates it will influence the German economy. German analyst and investor climate is expected to jump to 56.2. Japan rate decision: Wednesday. At its January monetary policy meeting, the Bank of Japan decided to maintain its monetary policy and continue to raise the monetary base at an annual pace of JPY 80 trillion. The decision was in line with market expectations. The bank noted a slight improvement in exports and a rise in industrial output and forecast a stronger expansion from lower oil prices. Inflation expectations also increased but expected to slow temporarily due to the oil price decline. UK employment data: Wednesday, 9:30. The number of people unemployed fell by 29,700 in December following a decline of 26,900 in November indicating UK’s labor market remains strong. Furthermore, average earnings have increased, a positive development to household spending. However, wage growth will be sustained only if production improves. The number of unemployed is predicted to decline by 25,200 in January. The unemployment rate for December is predicted to stand at 5.8% and wages at 1.7%. US Building Permits: Wednesday, 13:30. The number of US building permits declined 1.9% in December, reaching an annualized pace of 1.03 million units, while housing starts jumped 4.4% to 1.09 million units. Economists expected permits to reach 1.06 million. The main reason for the sluggish growth in the housing market is that wage growth is slow disqualifying many potential buyers from obtaining mortgages. The number of US building permits is estimated to reach1.08 million units. US PPI: Wednesday, 13:30. U.S. producer prices plunged 0.3% in December, the steepest decline in three years amid declining energy costs. The reading was in line with market forecast. Following this report the Fed reduced its inflation expectations, raising new doubts about future rate hikes. However policymakers regard the falling inflation is temporary. U.S. producer prices are expected to rise 0.4%. US FOMC Meeting Minutes: Wednesday, 19:00. In the last Fed decision back in late January, the Fed sounded optimism about the economy and about the “strong job market” to quote the statement. However, it continued urging patience regarding raising the rate and mentioned international developments. We will now learn how the members see the economy and how worried they are about events abroad. US Unemployment Claims: Thursday, 13:30. Initial claims for unemployment benefits edged up 25,000 to a seasonally adjusted 304,000 last week. However, the general trend still shows strength in the US labor market. Analysts expected a modest climb to 282,000 last week. The four-week moving average dropped 3,250 to 289,750. Economists expect jobless claims will remain subdued amid the massive job gain over the last three months. The number of jobless claims is expected to rise by 305,000. US Philly Fed Manufacturing Index: Thursday, 15:00. Manufacturing activity in the Philadelphia-region slipped into lower gear in January, reaching 6.3 points, following 24.5 in December. This was the largest fall in 11 months. Analysts expected a much higher figure of 20.3. The majority of responders reported that lower energy prices were having overall net positive effects on manufacturing business and the six-month outlook continued to be positive. Manufacturing activity is expected to climb to 8.8 points. The Pound made a rebound this past week and if the Euro and Yen follow suit, it could force a USD turn? 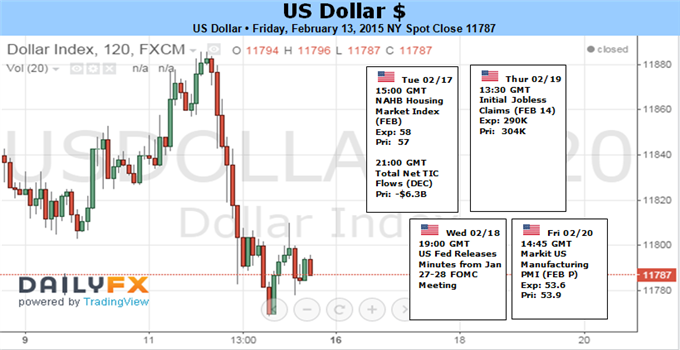 The Dollar’s relative fundamental appeal is strong. Backed by a pace-setting rate forecast, a comparatively-robust growth outlook and a market depth that can offer a buffer in case clouds gather; there is considerable appeal. Yet, how large is the Greenback’s theoretical premium? If the markets work to discount advantage and disadvantage, much of the currency’s strength should arguably be incorporated into current exchange rates. Further gains are certainly possible, but momentum – the technical embodiment of conviction – requires furthering the Dollar’s advantage or seeing the majority of its counterparts lose ground. There is a dearth of high-profile, yield-influencing US event risk on the docket ahead, but there are plenty of cross winds that may cause the USD problems. For the Dollar’s own motivation, this past week’s newsflow offered relatively little to feed the fixation on rate expectations. Both Fed Funds and Eurodollar futures were little changed from the swell they received following the strong wage numbers in the February 6 jobs data. According to these measures, the market is pricing a first hike around the September policy meeting. Depending on what poll you reference, economists and Primary Dealers are more hawish in their view between June and July. As we move closer and closer to the the nearest consensus and hit key event risk along the way, speculation will heat up. For now though, we are still at least four months out and this week’s docket doesn’t carry heavy-hitting data or commentary. If the changing tides of the Dollar’s own fundamental backdrop were the dynamic to this equation, we would likely see the currency consolidate or generate modest gains as time premium to the policy tightening burned. However, value is always relative. Though the Greenback is the world’s most liquid currency, its strength can change with the weakening or strengthening of its counterparts. Given its solitary reserve status, the rise or fall from one counterpart alone often does not carry enough weight to strongarm the Dollar. Yet, should a few major counterparts strengthen, it could swamp the Greenback. 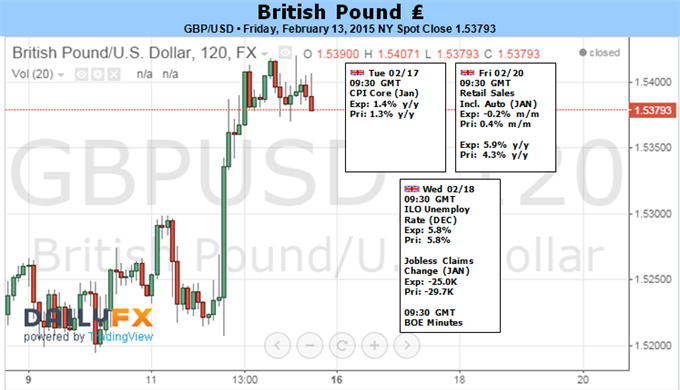 This past week, a significant move was made by the British Pound which led to a remarkable GBPUSD move above 1.5350. The Sterling found footing after the BoE’s Quarterly Inflation Report. Though the review warned a brief bout of negative inflation was on the horizon and the first rate hike could be pushed out, the currency seemed heartened that the dovish outlook wasn’t as deep as the market may have been pricing in. A turn from GBPUSD is only a first step and it didn’t force a USDollar break, but it did anchor the benchmark. A few more key moves along similar lines and we could trigger a cascade of sell orders. Ahead, the Pound will have another chance to gain traction on its rate forecast through its wave of January inflation data, the January labor report and even the minutes from the Bank of England last policy meeting – though this will likely rehash many of the same talking points that the Quarterly Report offered. Another substantial peer that may be prove the more underappreciated threat as a monetary policy spark is the Japanese Yen. Fully set in its open-ended QQE program, it may seem that the Yen is the traditional carry funding currency. Yet, given the recent concerns to come out of the BoJ that a weak currency was contributing to problems, this week’s Japanese 4Q GDP data and Wednesday morning rate decision should be watched closely. Far more influential as a counterpart will be the Euro’s health. We are not expecting a change to the ECB’s flight plan for its new QE program launching next month. Instead, the world’s second most prolific reserve currency will be stirred by the burgeoning concerns about the region’s stability as negotiations over Greece’s bailout terms grind on. Since the anti-austerity Syriza-led coaltion took over the government last month, little to know progress has been made towards compromise. With meaningful deadlines coming due, if the pressure eases back, a relief rally for EURUSD could produce a strong Dollar downdraft. Japan’s 4Q Gross Domestic Product (GDP) report may heighten the appeal of the Yen and encourage the Bank of Japan (BoJ) to soften its dovish tone for monetary policy as the region is expected to return to growth during the last three-months of 2014. The Japanese economy is expected to come out of the technical recession from 2014 as market participants look for a 0.9% rebound in the growth rate, and the recovery may push the BoJ to retain its current policy at the February 18 meeting as the central bank argues that any additional stimulus at this point is ‘counterproductive.’ As a result, Governor Haruhiko Kuroda may highlight an improved outlook for the region and promote a wait-and-see approach for the foreseeable future as the central bank head remains confident in achieve the 2% target for inflation over the policy horizon. With that said, the fresh batch of central bank rhetoric may spur a further decline in USD/JPY as market participants scale back bets for additional monetary support in 2015. At the same time, the Federal Open Market Committee (FOMC) meeting minutes will also be closely watched as a growing number of central bank officials show a greater willingness to normalize monetary policy in mid-2015. Indeed, the Fed may continue to highlight an upbeat tone for the U.S. economy as the central bank anticipates lower energy prices to have a positive impact on the economy, but the policy statement may do little to spur a near-term rally in USD/JPY as the slowdown in private-sector consumption undermines the outlook for growth and inflation. 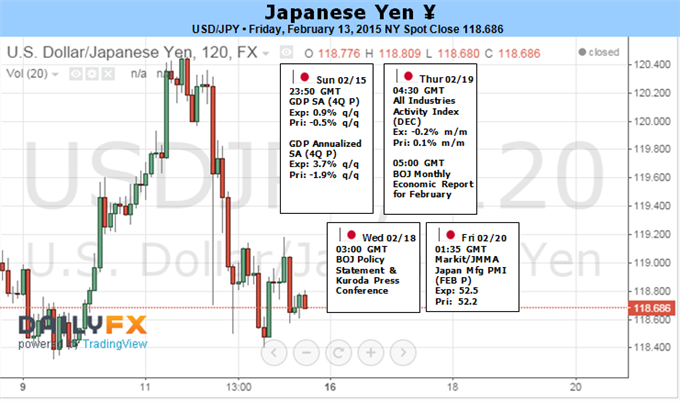 In turn, dollar-yen may continue to consolidate and face range-bound prices throughout the remainder of the month as market participants weigh the outlook for monetary policy. Despite the pickup in risk sentiment, USD/JPY may continue to give back the rebound from 116.86 and work its way back towards the monthly low after failing to push above the January high (120.73). As a result, we will continue to watch support/resistance in the week ahead, and may need a major fundamental catalyst to establish a new near-term trend in USD/JPY as a wedge/triangle pattern continues to take shape. The British Pound rose for a third consecutive week against the US Dollar after a hawkish-sounding Bank of England Quarterly Inflation Report rekindled interest rate hike speculation, as expected. Governor Mark Carney reminded investors that tightening is the next most likely direction for monetary policy, adding that the central bank intends to look past near-term downside inflation shocks from falling food and oil prices. Investors now price in at least one 25 basis point increase in the baseline lending rate over the coming 12 months, with futures markets reflecting bets on a move in the fourth quarter of this year. Sterling can hardly expect to coast upward unmolested however. There is much that can happen between now and the end of the year that can upend the currency’s recovery. The revival of Eurozone redenomination risk stands out in the near-term as nervous markets prepare for another round of negotiations between Greek and EU officials over the country’s debt woes on Monday. A similar sit-down produced no results last week and the situation looks increasingly intractable: Greece’s government won a key confidence vote, confirming its mandate to scrap the existing EU/IMF bailout program. Meanwhile, German Finance Minister Wolfgang Schaeuble bluntly dismissed rumors of a 6-month extension on Greek debt repayments as “wrong”. Both sides face negative fallout without an accord. Eurozone officials don’t want to endanger the bloc’s structural integrity by setting a precedent for a country to leave, an outcome with unknown consequences. Meanwhile, the newly-minted Greek administration surely understands its survival depends on ending economic hardship, which voters equated with EU-imposed austerity. Its fortunes might swiftly turn if a disorderly “Grexit” fails to end the malaise or compounds it.Political brinksmanship has been the status quo throughout the Eurozone debt crisis, so more of the same before a stay of execution is cobbled together is not surprising. If Monday’s meeting elevates hopes for a deal, the Pound is likely to face selling pressure as capital inflows seeking refuge from Euro-linked instability reverse course. Furthermore, the markets’ policy bets will continue to evolve with incoming economic news-flow. The coming week features a potentially formative bit of event risk as January’s CPI figures cross the wires. The headline year-on-year inflation rate is expected to drop to 0.4 percent, the lowest since at least 1989, but Mr Carney’s sanguine posture on this front will likely dilute the figures’ potency. Instead, all eyes will be focused on the core CPI print – a reading that excludes the influence of volatile items the BOE has opted to dismiss – which is expected to rise for a second month to 1.4 percent. UK price growth data has broadly tended to underperform relative to consensus forecasts over the past two years. If that trend continues and a soft core reading emerges, Sterling may retreat as rate hike expectations cool anew.